A logo is not just a graphic symbol for a website, a sign or marketing collaterals. It’s the cornerstone of a company’s brand identity. It’s the first thing your clients and partners associate with your business. It’s important to understand that a logo is created once and for all. While you can make minor changes to your design along the way, overhauling the entire logo concept can negatively affect your company’s recognition. With that in mind, you must put lots of effort into creating an ideal emblem that will successfully represent your business throughout the years. Read this article to learn how you can create a logo without watermarks, with the help of an advanced online service. As a bonus, we’ll tell you how to use your logo as a watermark on your marketing collaterals. Your choice of a logo creation method depends on your budget and design skills. We’ve listed the most common options available to business owners. Hire a designer. If design is not your element, you can search freelance websites for a professional designer. This is your chance to get a good emblem at a reasonable price. Keep your eyes peeled for dishonest contractors who disappear once they receive advance payment. Draw a logo by yourself. Doing everything yourself is a sure way to save money. Plus, you’ll be able to create a logo just the way you want it. If you’ve opted for this method, you must know how to use graphic design programs (e.g., Photoshop, Illustrator). Plus, prepare to spend plenty of time brainstorming ideas and drawing sketches. Commission a design studio. By hiring a design studio, you maximize your chances of getting a unique and memorable design that will be a worthy visual representation of your business. Design agencies care about their reputations and provide good levels of service. The most common deal breaker is price. High-profile studios charge a lot for their creative efforts. Plus, you’ll have to wait up to several weeks for the result. Use an online service. Online logo generators are, hands down, the best option for aspiring entrepreneurs. These platforms boast powerful functionality, allowing users to create beautiful designs in just minutes. On some websites, you can even download a free logo without watermarks. Hold a contest. You can go to a special platform and launch a contest among professional designers. You must create a detailed brief containing your requirements, goals, and other information that designers will need to know. Once the contest is over, you must choose the best design. The winner gets a payout. While holding a design contest is an attractive opportunity, it’s not an affordable one. To get consummate designers interested in your contest, you must set a pretty high budget. Each of the methods listed above has its pros and cons. Unfortunately, no one method will meet every need. However, we recommend exploring the possibilities of online logo generators. It’s a good choice for beginning entrepreneurs and small business that need a smart logo with a reasonable price tag. In the second part of this article, we’ll break down how a logo maker works. You can use your freshly designed logo in a number of ways. Did you know that you can use your corporate emblem as a watermark on photos and videos? A watermark indicates who owns the rights to a photo or video and protects it from being copied. Watermarks are widely used by small businesses, freelance photographers, and online shops to protect and promote their work. A watermark starts with a logo on a transparent background. With the Logaster logo maker, you can get a ready-to-use logo on a transparent background in just a few clicks. Your logo file will be available for download in PNG format. To add watermarks to your logo manually, you can use Photoshop and other graphic editors. However, because this is a tiresome process, most entrepreneurs prefer to use special services. You can either use an online service or install a program to your computer. Either way, you’ll get watermarks applied to your emblem quickly and easily. 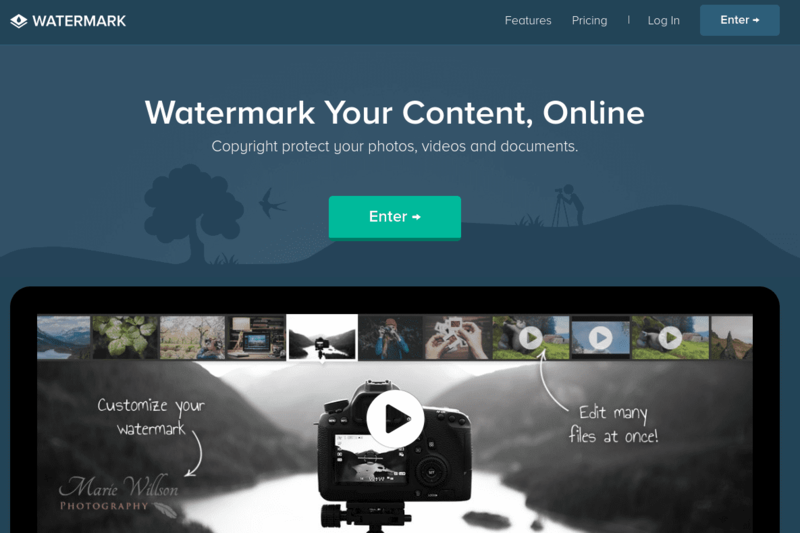 We’ve put together a list of top platforms for adding watermarks to your content. Visual Watermark is a watermark software for Windows and Mac with a straightforward interface and the batch-editing feature. 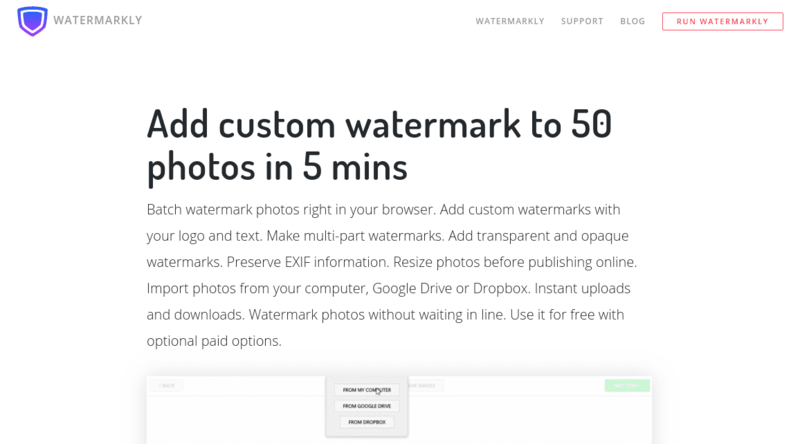 It can offer you protection against automated watermark removal and multi-element templates.Watermark does not mess with resolution of images and it never changes the original ones as it saves the watermarked photos in a separate folder. It’s good value for money too! You can choose from three one-time payment plans – basic ($19.95), plus ($29.95) or premium ($39.95). Watermarkly is an online app that allows you to upload images from your computer, Google Drive or Dropbox, which can be extremely helpful if you store most of your images on these storage clouds. You can process several pictures at once, but if you need to batch edit a bigger number of photos, you can download Watermarkly desk-top version for Windows and Mac, which also happen to have a feature of adding watermarks to your videos. There are one-time payment plans available to you: basic ($19.95), plus ($29.95) and premium ($39.95). 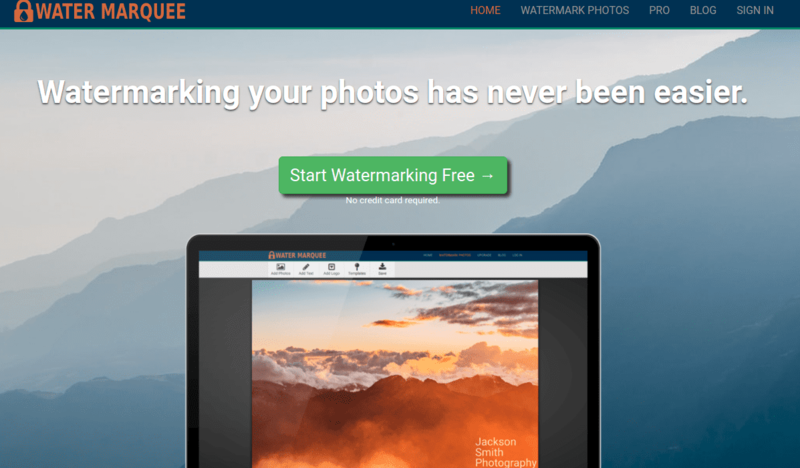 Watermarquee is an online watermarking app, which you can use for free. It’s quick and easy to work with. However, it does not support full resolution images. If you’re using the free version, you can only upload pictures smaller than 3 MB. If you want to work with larger photos, you’ll have to upgrade for a one-time fee of $12. Unfortunately, Watermarquee does not work with videos. 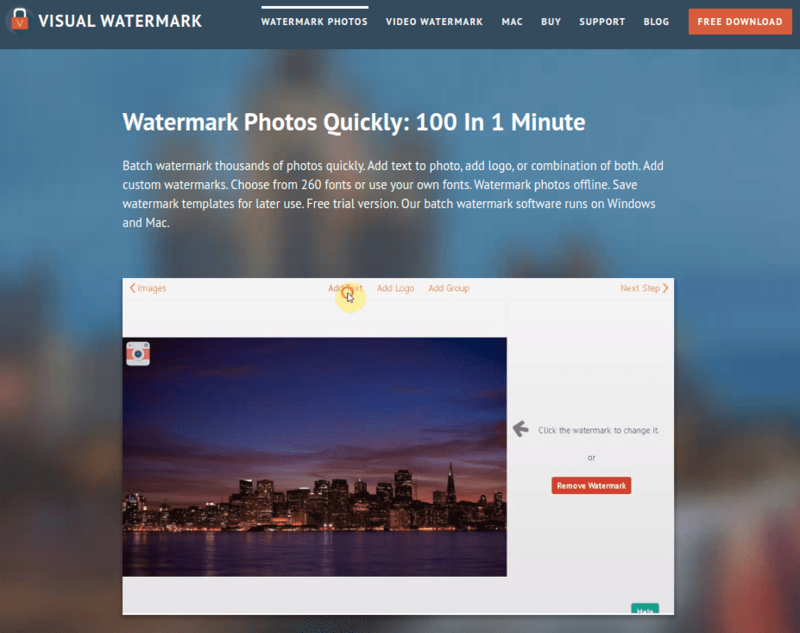 Watermark is an online app, which allows you to add a watermark to dozens of photos in one batch. You can upload pictures from your computer, import from any storage cloud of your choice or even from Facebook. The downside, though, is that the app scales down your images and does not allow you to choose the size when exporting. The basic plan is free of charge, but it doesn’t offer you much. If you wish to upgrade, it’ll cost you $6.99 per month or $49 per year. Working in Adobe Photoshop isn’t rocket science. The beautiful thing is that you don’t need special skills to watermark your image! Be sure to watch this video guide on how to add a watermark in Adobe Photoshop. Logaster is an advanced logo generator that creates professional-looking designs with minimum effort on the user’s part. It incorporates clever algorithms that generate hundreds of logos based on your industry and keywords. Your only task is to decide which option you like best. The whole process takes no longer than a few minutes! After creation, you can download logo in PNG formant with transperent background and use it as watermark. Check out our step-by-step tutorial on how to use Logaster to make your creative vision come to life! 1) Specify your company name and industry. 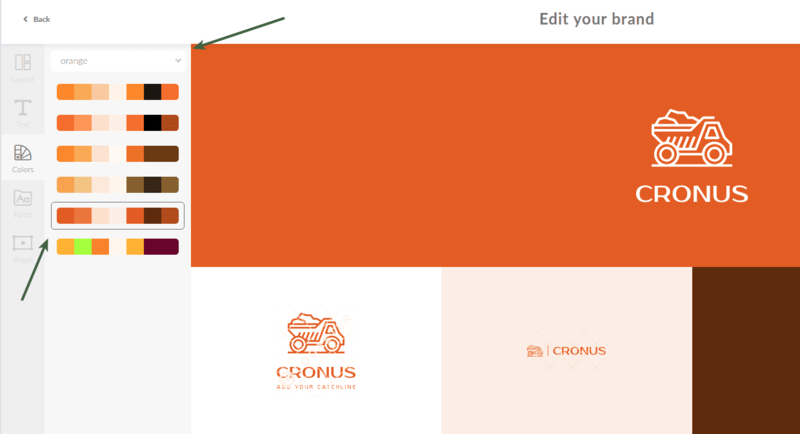 In Step 1, you’ll enter the name of your business and select your industry from a drop-down list. You can also type in your corporate slogan if you want to see it on your logo. To check the availability of your company name and domain name, use special sites like Shopify, Name Mesh, etc. Read here about how to choose the best name for your business. 2) Choose an icon. On the next page, you’ll see a big selection of icons for your industry. Luckily, the search option is available. You can search images by tags or keywords. An icon is probably the most important part of your logo. It’s the first thing that establishes an emotional connection with your audience. Your icon must fit your specialization, telling your potential customers what products and services you offer. For example, it’s a good idea to use the tools with which you work every day (e.g., a hammer for a carpenter, a computer for a financial analyst, etc.). Plus, when choosing the right image, keep your customer persona in mind. 3) Choose a color. 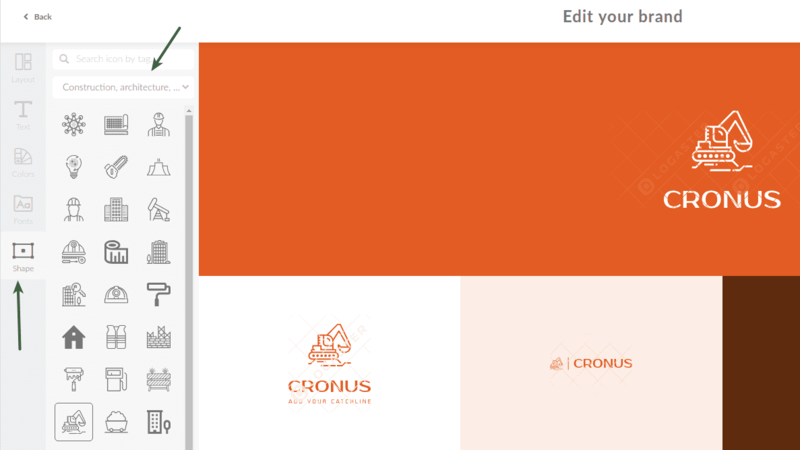 The next step is to create a winning color palette that will emphasize your brand personality. If you’re going to use several hues, be sure to use special programs (e.g., Adobe Color) to build a balanced color combination. To apply such a combination to your logo, simply enter its HEX code in the Logaster editor. Your choice of color depends on the idea or message you want your emblem to convey. While some companies opt for reserved hues (grey, blue) to communicate consistency and trust, others view invigorating colors (red, yellow) as an effective way to grab attention. The biggest mistake that amateur designers make is using too many colors. Confine your selections to 1-2 main colors and 1-2 additional shades. 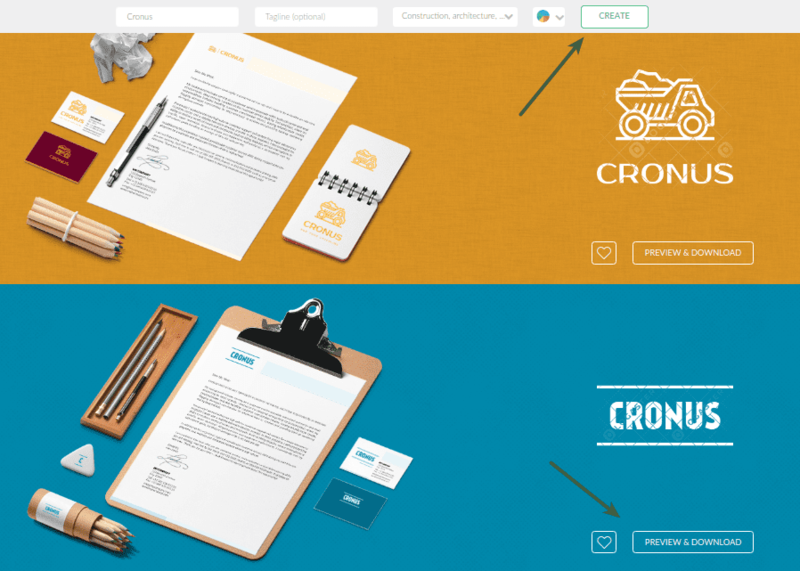 Click here to learn how to choose the right colors for your corporate design. 4) Choose a font. If you don’t like the default font on your logo, you can easily replace it with another one. Luckily for picky designers, Logaster offers a mind-blowing collection of fonts. You can even use different typography for your company name and slogan. 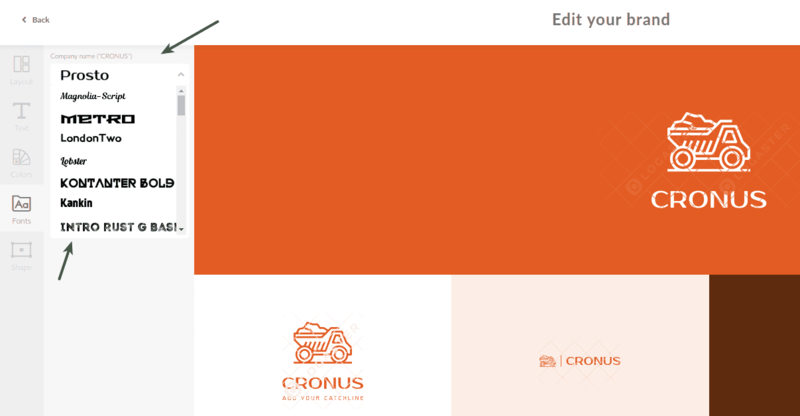 5) After creating logo, download it in PNG format with transperent background. Us it as a watermark via services which we mentioned above. What is meant by a good font in logo design? First, your font must remain legible when your design is scaled up or down. Give preference to simple, minimalist typography solutions. When it comes to creating a logo, overly decorative fonts are a no-go. Also, your font and icon must create a harmonious composition. As you can see, there are different ways to create a good logo. However, if you’re looking for the best price/quality ratio, you should consider using logo generators. 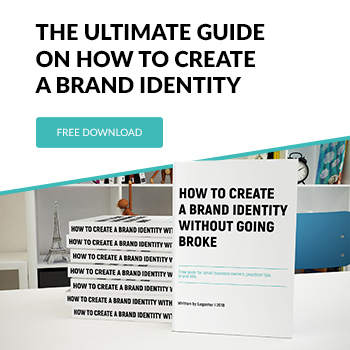 In this article, we’ve shared detailed instructions on how to create an effective logo without watermarks with the Logaster logo maker. Also, we’ve hand-picked a few online services that will help you watermark your content with zero effort.